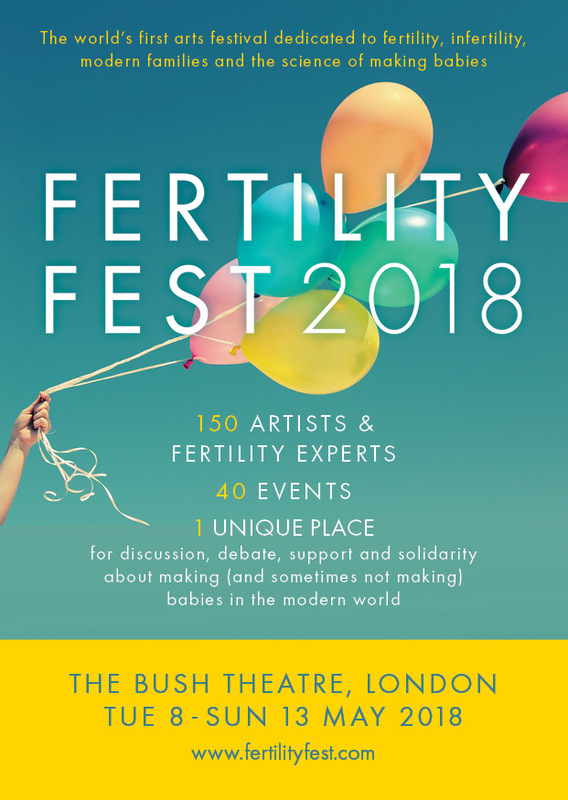 I have spent the past few days at Fertility Fest at the Bush Theatre in London, and wanted to thank Jessica Hepburn and Gabby Vautier for organising such a wonderful and inspiring event. It was a unique opportunity for people affected by fertility problems and treatment, for those working in the fertility sector, for those who have families not created in the traditional way, for academics and for the general public to come together and to learn and be inspired. It was absolutely fabulous! I met amazing artists and so many inspiring and interesting people doing all kinds of different work to help and support others in different ways. It was a real honour to be involved. A special thank you to the lovely Saskia Boujo and everyone I shared a panel with – artist Gina Glover, Dr Kay Elder, Sally Cheshire, Dr Roy Farquharson, Maria Da Luz Ghoumrassi, Dr Shantel Ehrenberg, Barbara Scott, Jane Denton, Anna Furse, Nina Klaff, Drunken Sailor Theatre Company, Victoria Macdonald, Foz Foster, Tabitha Moses, Professor Lesley Regan, Professor Simon Fishel, Yvonne John, Sue Macmillan, Carmel Dennehy, Tracey Sainsbury, Fiona Duffelen – to Paula Knight who was unable to be with us but sent a video – and of course, to those wonderful women Jessica and Gabby who have created something really very special! It will be the first event of its kind in the UK taking place in London and Birmingham, and it’s called Fertility Fest. The event, devised by writer Jessica Hepburn and producer Gabby Vautier, will bring together some of the country’s leading writers, visual artists, theatre-makers, film-directors and composers alongside some of the country’s foremost fertility experts for a day of performance, discussion and debate. Topics under the artistic microscope include facing the diagnosis of infertility, IVF, donation, surrogacy, the male experience, egg freezing, involuntary childlessness and alternative routes to parenthood.The full day of events concludes with a performance of a new play from award-winning writer Gareth Farr called The Quiet House about one couple’s journey when they enter the world of IVF. Fertility Fest is in London on Saturday June 11 at the Park Theatre in Finsbury Park and in Birmingham on Saturday May 28 at Birmingham Repertory Theatre. The artists involved in the days include Aaron Deemer, Amanda Gore, Amy Rosenthal, Fergus Davidson, Fiona Duffelen, Gabby Vautier, Gareth Farr, Jessica Hepburn, Jo Ind, Jody Day, Julia Copus, Jude Christian, Kazuko Hohki, Katie Barlow, Louise Ann Wilson, Matthew Dunster, Paula Knight, Peter Guttridge, Stander Chohan, Ronke Adekoluejo, Sarah Esdaile, Somalia Seaton, Steve Ball, Tabitha Moses, Tina Reid-Persin and Yann Seznec. The experts in the field joining them for the day will include Professor Allan, Pacey, Professor Geeta Nargund, Laura Witjens, Professor Jacky Boivin, Janine Elson, Juliet Tizzard, Kate Brian, Natalie Silverman, Sally Cheshire, Dr Sofia Gameiro, Dr Sue Avery, Professor Susan Bewley, Professor Susan Golombok, Tracey Sainsbury and Victoria MacDonald. If you haven’t seen it already, you may be interested in this article from The Guardian about award-winning artist Tabitha Moses, who currently has an exhibition about her experiences of fertility treatment at Liverpool’s Walker Art Gallery. Tabitha had two unsuccessful attempts at IVF before finally getting pregnant using eggs from a donor, and now has a young daughter. Her exhibition, which is titled Investment, uses white gowns like the hospital gowns you wear for egg collection and she has embroidered them with images that symbolise her own experiences of fertility treatment. She worked with two other women and features the images of their experiences on other gowns. The embroidered gowns are beautiful and will resonate with anyone who has personal experience of fertility problems and treatment. Tabitha’s exhibition has now been extended through to the spring, so there is plenty of time to catch it if you are in Liverpool over the next few months! If you’re based near Liverpool, you may already know about the exhibition of work by award-winning artist Tabitha Moses at the Walker Art Gallery called Investment, which is her response to her experiences of fertility problems and IVF. Working closely with other women undergoing IVF, Tabitha explores their hopes and fears in a series of hand-embroidered hospital gowns with photographic portraits by Jon Barraclough. Tabitha is also running some really interesting workshops called the Fertile Minds Creative Workshops for people with experience of assisted conception along with Rebecca Sharp. They will lead creative play using poetry and visual art techniques to explore participants’ experiences of assisted reproduction. No previous art or writing experience necessary. Rebecca is a writer, artist and educator whose work in poetry, performance and prose can be seen through a series of acclaimed projects incorporating visual art, film, music and sound art. She has worked with a variety of community groups to explore identity, boundaries and the power of words, often in collaboration with other artists. She is based in Fife and works nationally and internationally. Rebecca was artist-in-residence with Metal in 2009-2010 and lived in Liverpool for ten years. Tabitha Moses makes work about people; she likes to tell the stories of the overlooked and aims to do it with sensitivity and eloquence. She enjoys exploring art, crafts, cooking and gardening with people of all ages,. Tabitha has worked with residencies and galleries in Bangladesh, Pakistan, Poland, Greece and across the UK. She lives in Liverpool with her husband, daughter and two cats.